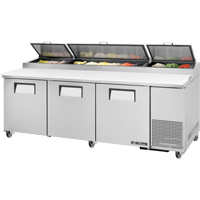 True’s pizza prep tables are designed with enduring quality that protects your long term investment. Oversized, environmentally friendly (R134A) forced-air refrigeration system holds 33°F to 41°F (.5°C to 5°C). Complies with and listed under ANSI/NSF-7.